There have been many skylarks present this year. Alex has recently reported a number of juveniles flying. On one occasion he he recorded ten birds in the air at one time. Another successful event - . 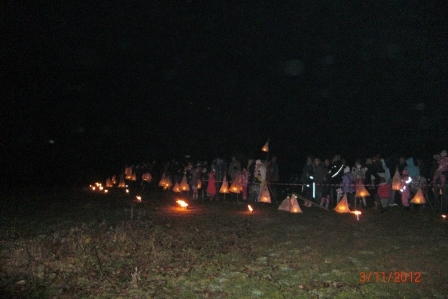 Ifton Colliery Band, fireworks, lanterns, a storyteller, hot food, & happy faces! You can enjoy it in 2013. 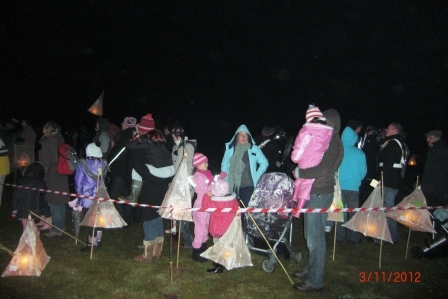 Come to the workshops - Make your own free lantern - march up the hill in the footsteps of the miners - follow the Ifton Colliery Band -enjoy the entertainment - meet friends. 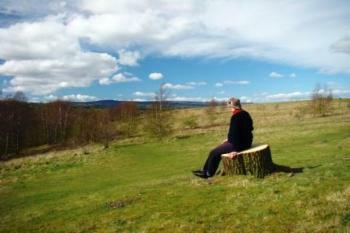 The weather was kind and some fifty plus people, enjoyed a fabulous family day. It was a family day! There was a cake, made, and royally iced, by Elizabeth, Ann and Camilla! 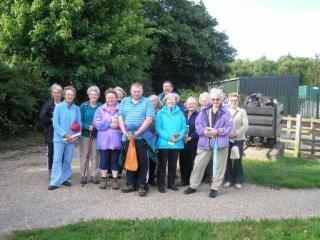 There was a treasure trail led by Gareth Parry. He entertained and educated us in the particular behaviour of foxes, demonstrated how to sniff poo and extracted a food cache from a vole's burrow. The children, indeed, all of us, enjoyed it immensly. and finally the commerative trees were planted. 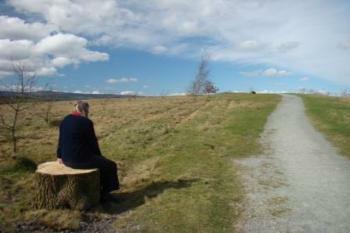 It was a good day, it was a great day, and we do hope all our visitors enjoyed themselves. Thanks to Alex Olah for the photographs. An evening with Stephen Lewis proved interesting, entertaining and educational. Stephen works for Butterfly Conservation and is charged with the restoration of Prees Heath! The site was partly given over to food production after WW2 but due to its importance as an historic heathland and grassland, it is now being restored. Stephen is also familiar with many of the local sites such as Llannymynech and Nant Mawr and has a comprehensive knowledge of butterflies and their ecology. We were reaquainted with many of the butterflies with which we are familiar, but we all felt we learnt many new facts about them. It was particularly worrying that there were many familiar species that were declining in numbers. One reason given was loss of habitat. Stephen used a computer slide presentation to illustrate his narrative and finished with a spectacular video showing an extract from a television programme "The Nature of Britain", featuring Prees Heath and the Silver Studded Blue Butterfly; so called because of the silvery 'studs' in the middle of the black spots near the edge of the underside of the hindwings. The story of the Silver Spotted Blue is one of a close relationship with the black ant (Lasius niger), and a dependance on both the common heather (Calluna vulgaris) and the bell heather (Erica cinerea) as food sources, which ultimately results in a flight of butterflies in late June/July. The butterly only lives a few days but the numbers at Press Heath are such that this is said to be quite spectacular. Ann Williams thanked Stephen for his enjoyable presentation and the evening was rounded off with tea and butterfly cakes, courtesy of Camilla and Ann! What did you expect! 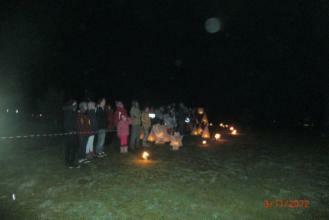 There were over a hundred lanterns on display and despite a heavy shower everyone semed to enjoy themselves. Please send in any photos you may have taken. This bird was sighted recently on the meadows and we now have a proffesional opinion as to what it is. Alex was right! 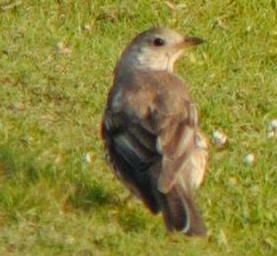 It has been confirmed as a juvenile Mistle Thrush. 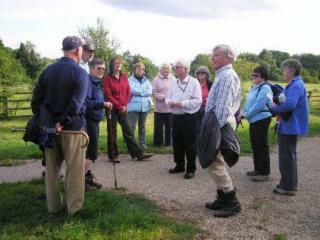 These photos were taken at the County walk at Ifton Meadows on Thursday 16th June, 2011.There were 42 members and friends, plus 4 stewards from Erbistock WI, who followed 4 guides, provided by Friends of Ifton Meadows, around the nature reserve. They enjoyed both learning about the history of site, and seeing the flora of the site,in particular the common spotted orchid which this year can be found in several areas. The last group also had the pleasure of the sight of a Red Kite. A lovely, clear, if slightly chilly evening was topped off with refreshments at St.Martins Centre provided by Erbistock WI. 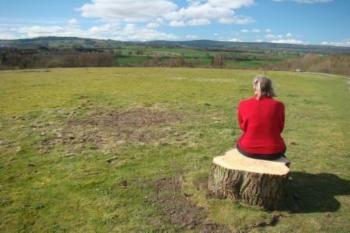 Friends of Ifton Meadows have placed 3 large tree trunks sections at different viewpoints beside footpaths for use as seats. Some twenty plus people enjoyed an entertaining couple of hours listening to Mr Trevor Blackshaw speak on the Importance of Birds in our garden. The talk was accompanied by slides and was very interesting. Trevor, an ambassador fot the BTO, intends to stay in touch and may be able to spend more time with us.